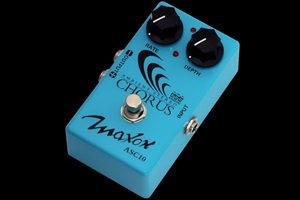 The Maxon ASC10 is an analog stereo chorus pedal which provides spacious ambient sound. Creates clear and sensitive chorus sound with two simple controls. Offers bold, rich spacious sound, which is a distinctive characteristic of analog chorus. All-rounder for any musical instruments (electric guitar, acoustic guitar, bass guitar, keyboard). Variable width of LFO rate is quite large. Leslie speaker effect is available by setting RATE control to faster position (CW). Provides dynamic and expressive true stereo chorus effect with two amplifiers. Employs noise gate circuit to create natural and clear chorus. Easily viewable effect LED for trouble-free performance and battery condition check. RATE LED indicates modulation speed rate. LED brightness synchronizes with the rate you set.